In October, prepays remained below 8% for the fifth time this year, decreasing by 1% from September. As to the cause, we saw a double-digit decrease in defaults that more than offset a singledigit increase in voluntary prepayments. Defaults, which fell by 23%, remained below 2% for the 14th month in a row. Historically, this reading was the 7th lowest since 1999. As for voluntary prepayments, they rose back above 6% after one month below this benchmark. This is also the 6th time this year that we have seen voluntaries above 6%. As for the detail, overall prepayments fell 1% to 7.69% from 7.79% in September. In comparing prepayment speeds for the first nine months of 2014 to the same period in 2013, we see that this year is running 6.86% ahead of last year, 7.65% versus 7.16%. As for the largest sector of the market, 20+ years to maturity, prepayment speeds fell by 5% to 7.39% from 7.75%. 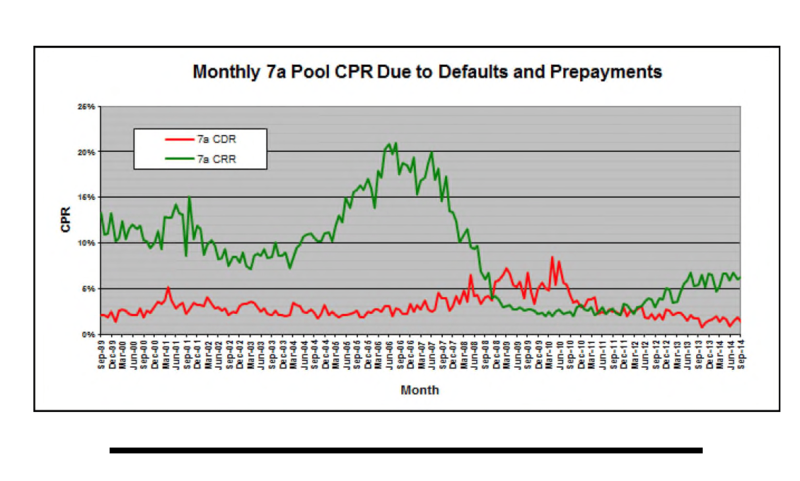 Turning to the CPR breakdown, the default CPR decreased by 23% to 1.41% while the voluntary prepayment CPR rose by 5% to 6.28%. Preliminary data for next month suggests that prepayments will rise above 8% for the first time in four months. Turning to our maturity buckets, prepayment speeds fell in four out of six categories. Decreases were seen, by order of magnitude, in the 13-16 year sector (-33% to CPR 2.45%), 16-20 (-30% to CPR 5.63%), <8 (-12% to CPR 11.93%) and 20+ (-5% to CPR 7.39%). Increases were seen, also by order of magnitude, in 8-10 (+48% to CPR 9.20%) and 10-13 (+11% to CPR 9.07%). While we expect an increase in prepayments next month, we should end up 2014 below 8% for the year. After five years of low prepay speeds, this compares favorably to last year’s 12 month prepayment speed of 7.11%.